Generates a shadow on the Background clip using the alpha channel of the Foreground or an optional Matte, then composites the Foreground over the Background to give the final result. Foreground: The current track. The clip to use as foreground, and the alpha channel of this clip is used as the matte to generate the shadow. Background: Optional. The shadow is drawn onto this Background clip. Matte: Optional. If this is provided, its alpha channel is used instead of the Foreground to generate the shadow. This input can be affected by the Invert Matte or Matte Use parameters. Shift: X & Y, Default: screen lower right. Shadow Opacity: Default: 1, Range: 0 or greater. Scales the opacity of the Foreground without affecting the shadow. Lowering this can be used to fade out the Foreground, or setting it to zero prevents the Foreground from being composited over the result at all. 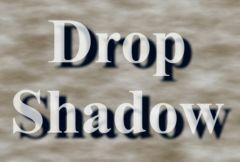 Determines which Foreground or Matte input channels are used to make the shadow. Enable this for a better composite if the Foreground pixel colors have been pre-multiplied by their Matte values. This is also known as an 'additive' composite.